These pages just keep getting better and better! 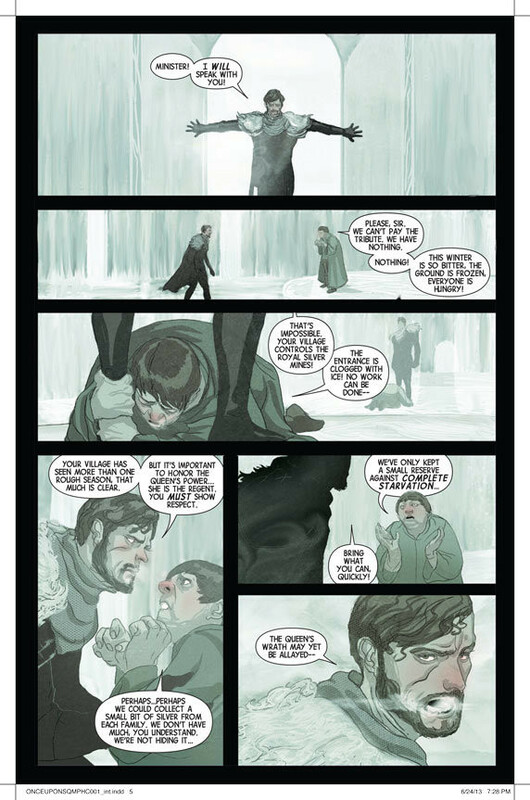 Here's the fourth and final preview page from the new graphic novel from Marvel, Once Upon a Time: Shadow of the Queen! In case you missed our first preview, second preview or third preview, the story explores the relationship between The Evil Queen and The Huntsman she enslaved in Fairy Tale Land and was plotted by series writer and producer Daniel T. Thomsen. Once Upon a Time: Shadow of the Queen will be available September 4th in bookstores, comic shops, the Marvel Comics app and online in the Marvel Digital Comics Shop. Check the full press release below for details. Dive into the immersive world of ABC’s Once Upon a Time like never before as Marvel Entertainment and Disney-ABC Television Group are proud to unveil your first look at Mike Del Mundo’s pages to Once Upon a Time: Shadow of the Queen! The first official graphic fiction tie-in to the hit ABC series takes fans deep into the world of Fairy Tale Land, where the fabled storybook characters we all grew up with are real, with the forces of good and evil locked in an epic struggle! Check back next Wednesday to see new panels from Once Upon a Time: Shadow of the Queen!